Ask 10 people what it takes to be an entrepreneur and you'll probably get 10 different answers. Ask LinkedIn, on the other hand, and you'll get a pretty detailed picture complete with schools to attend, companies to start off with and places to live. That's because LinkedIn recently did an analysis of the 120 million public profiles on its network and zeroed in on the people who are entrepreneurs. From there, it looked at a raft of data about those people as compared with the average LinkedIn user, ultimately painting a fairly detailed portrait of the typical startup founder. I had a chance to speak yesterday with Monica Rogati, a senior data scientist at LinkedIn. Think you can predict what a typical entrepreneur looks like? You may have a few surprises coming. LinkedIn picked out the entrepreneurs from the rest of its member profiles by zooming in on a few key things. Specifically, it focused on those who identify themselves as founders or cofounders of U.S. companies that were created after the year 2000 and that currently have between two and 200 employees. Small law, consulting and real estate firms were excluded from this data set, as were limited liability companies. The result was more than 10,000 entrepreneurs whose profiles LinkedIn then compared with the average LinkedIn member. A synopsis of some of the key resulting data is shown in the infographic below; more detail can be found in Rogati's blog post on the topic. One of the biggest surprises, I think, is that today's entrepreneurs are not typically the young “wonder kids” they're often portrayed as, nor are they usually serial entrepreneurs. A full 65 percent, in fact, are 30 and older, according to LinkedIn's data, and 25 percent are 40 or older. Only 2 percent, meanwhile, are serial entrepreneurs. That entrepreneurship is one of the most commonly found school majors pursued by entrepreneurs is not surprising; it's interesting to see, though, the dominance of technical degrees that follow after that, including computer engineering and computer science. The top 10 entrepreneurial business schools also fell out much as you'd expect, with Stanford, Harvard and MIT's Sloan school at the top. Whereas the Bureau of Labor Statistics says the average tenure in a position is 4.4 years, Rogati told me, the entrepreneurs in LinkedIn's data typically stayed in a job just 2.5 years. 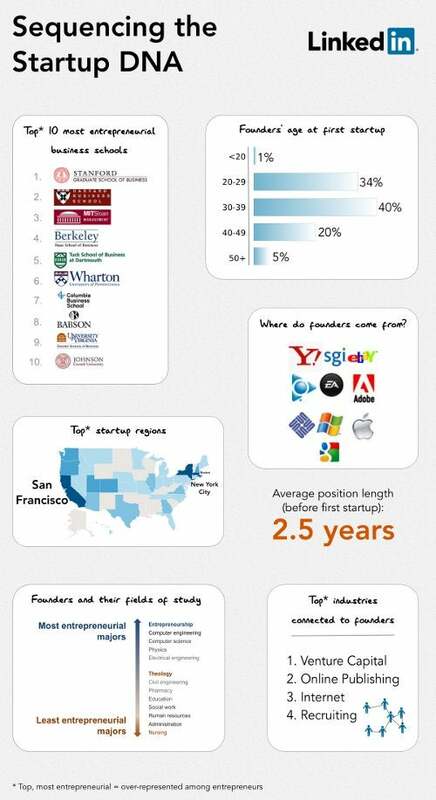 Which companies are best to work at before you launch a startup? Pretty much all the usual suspects in the tech industry, including Adobe, Apple, EA, eBay and Google. Just as you might expect, then, it's a good idea to live in San Francisco, New York or Boston. Finally, one last tidbit that seemed especially telling is the type of connections entrepreneurs maintain on LinkedIn. Heavily represented in their networks are venture capitalists, bloggers and recruiters--all keys to helping any young company achieve success.